I didn't tell you guys at the time, but I decorated my first wedding cake this summer. No, not the cake for my own first wedding--that has yet to occur. My friend, being suitably impressed with my mad skills (she says halfway facetiously), asked if I'd be willing to take on the challenge for her big day. I was indeed willing, for she's a great friend (and not at all prone to bridezilla behavior). To make a long story short, I have a new appreciation for wedding cake decorators. This particular creation was three tiers of lemon cake with lemon-flavored swiss meringue buttercream, and it was quite an undertaking. There was a lot of recipe testing and tasting, for both the cake and the frosting. (That part was not a struggle.) I also learned all about proper support and transportation and symmetry, which I'm sure will be useful for future endeavors. I had big plans for the designs on the side of each cake, but when the day came around, time and amount of experience were not on my side. The end result was still lovely and the bride was pleased, but I was exhausted, a little disappointed, and a lot more admiring of you professionals out there. 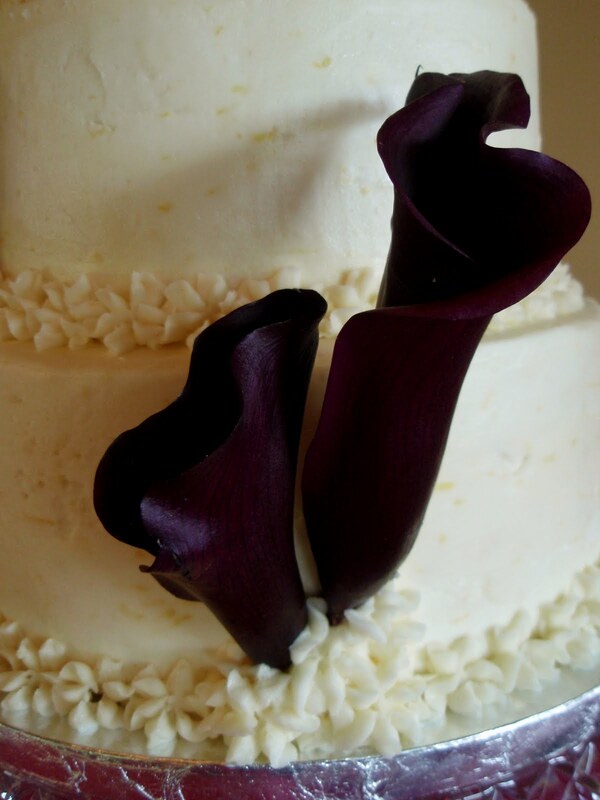 My friend wanted deep purple calla lilies to accent her cake--aren't they a gorgeous color!?! Another lesson learned: Adding lemon zest to the frosting makes it IMPOSSIBLE to get a perfectly smooth application. Speaking of wedding cakes, I'll bet most of you are familiar with the classic Italian cream wedding cake. It's chock-full of pecans and coconut, and it requires the separation of eggs and some white whippage to produce a lighter, more tender crumb. It's delicious and full of great textures (and coated with cream cheese frosting), but because of this, I don't think it's a cake of which you'd want multiple tiers. That's just asking for a cake collapse. Preheat oven to 350°F and grease up three 9-inch round cake pans. In a bowl with an electric mixer beat together sugar, shortening, and butter until light and fluffy. Add egg yolks, one at a time, beating well after each addition. Into another bowl, sift together flour, baking soda, and salt. Beat flour mixture into egg mixture in two batches alternately with buttermilk, beginning and ending with flour mixture. Beat in vanilla, coconut, and chopped pecans. Beat egg whites in another bowl until they just hold stiff peaks and fold into batter gently but thoroughly. Divide batter among pans, smoothing tops, and bake in upper two thirds of oven, switching position of pans in oven halfway through baking, until a tester comes out clean, about 30 minutes. Cool cake layers in pans on racks 10 minutes and invert onto racks to cool completely. Fill and frost lavishly with cream cheese frosting. Decorate as desired. What a splendid cake! It looks so beautiful and delicious. The cake looks gorgeous! Creamy filling looks really rich and luscious. Ahh, we learn from our lemon zest mistakes. I think you did a smashing job. And the dark lilies do look lovely. My sister is getting married this very weekend: thank god I did NOT volunteer to bake their cake! Looks absolutely gorgeous! You did a beautiful job! What an undertaking. I'm swooning over the photo of the slice of cake...the pale colors, the textures, that frosting, the little nuts...it's been a while since I've been to a wedding, can you tell? Great job, especially the calla lily! You are a brave soul. It looks beautiful and the flavours sound delicious. Beautiful cake, Grace! Just dying to dive into it with a fork! Calla lilies are my favorite flower... that purple is beautiful. The zest may make it impossible for a smooth application but I bet it tasted FANTASTIC! Way to go on your first foray into wedding cake decorating. You are a good friend - I've never tried it but can imagine the stress that backs up such an endeavor. The cake looks so lovely, though, I am impressed! Grace, what a beautiful cake and pecan and coconut? Delicious! Love the 3 layers...you have a very lucky friend! Yum Italian cream - always a great choice. And beautiful with the dark calla lilies against the white icing. You have a very lucky friend indeed. Kudos to you Grace. You did an awesome job!!! You are so brave. I, for one, would never, ever attempt such a feat. It looks stunning. I bet it sure was a hit! BTW, Happy Bourbon Heritage Month!!! The cake sure looks delicious! I give you lots of credit for even offering to make your friend's wedding cake. I can't think of a job much more stressful than that. This recipe sounds great and the slice looks wonderful. I will say when I go to a wedding I am more interested in how the cake tastes than anything...I love some good wedding cake! Wow - doing someone's wedding cake is a huge thing - and I recently found out that adding lemonzest to a custard makes for a not-so-pleasant texture - live and learn! I've always wondered why you don't bake professionally! Maybe this is a sign! you are a wonderful friend to take on a wedding cake! That eye-tailan cream cake looks scrumptious!! I had calla lillies on my wedding cake, so the thought a purple lillies..Awesome!! Your cake looks lovely, and I think the flavor from the lemon zest is way more important than perfect smoothness! Italian cream cake is one of my favorites too. How awesome! The cake is really gorgeous! I am so incredibly impressed! Making a wedding cake is no small feat, even for a professional! Given that I am 100% Italian...I can't imagine how I've never had this before. I need to go to more weddings. Wow, Grace, that is seriously impressive! What a beautiful cake! The flavor sounds pretty delicious too...with coconut and pecans I know I'd love it! Those flowers on the cake are a beautiful shade! I think the zest gives it an elegant, textured look :) Well done, and congrats to the bride and groom! It looks spectacular, but my goodness, wedding cakes are hard work! I'm so impressed, Grace! I tried my hand at working with a bride, though she wasn't a friend, and I was so relieved when it didn't work out. :) Though I did really enjoy trying out new cake recipes and flavor combinations! Your cake sounds just wonderful! I admire anyone that can made a wedding cake. I'm impressed!! And it sounds like it tastes just as good as it looks, which isn't the norm for wedding cakes!! I go away for awhile and you turn into a professional baker! Gorgeous! 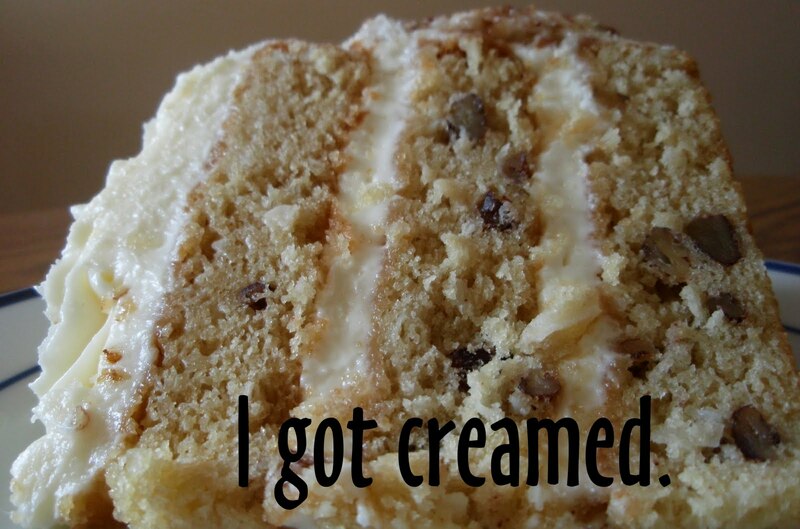 Italian Cream Cake was always my dad's favorite until he ended up with a milk allergy. And yes - those flowers are gorgeous. Good for you for taking on this challenge. I am sure it was well received!!!!!!!!!!!!!!! It looks magic! In Australia and the UK the norm is still a fruitcake with marzipan and royal icing. I've made the cake for a wedding but not decorated it, I am totally impressed by your work! Oh man-I made a flower girl dress for a friend 17 years ago, and nearly lost my mind-I can't imagine make the cake. You did a great job and I love that purple. Maybe a side business is in the works.....? I am so impressed! I'd never attempt a wedding cake; it would be a disaster. (or maybe I'd make one in secret so only I would see the mess.) It's the decorating that would be my downfall. Well done! This cake looks amazing! Fluffy & very moist. What a beautiful cake! You did a wonderful job and that frosting is making my mouth water. Good friend or not I wonder if you'd be willing to do it again?? I thought at first it was a piece of cake to do (pardon the pun) but definitely appreciate the amount of work not to mention second guessing when you do this. From what I can see, it looks pretty darned perfect to me and your friend is lucky to have a friend as generous as you are. Looks and sounds like a dream -- you are a brave lady and I now have an even greater respect for you! Impressive undertaking! Wish we could see a bigger photo - it looks so good! I like the specks of yellow lemon zest...even if it doesn't give smooth spreading, it gives it a nice pop of colour! You show all these cupcakes and cakes and don't give the recipe. What is the recipes for the Cream of the Crop cake? or is it a secret!